How to protect your outdoor LED screen? 2. In case of thunder , strong typhoons and other weather disasters , should be promptly cut off the power , the display until the weather returned to normal after the power is turned on. 3. The internal display is strictly prohibited water, non- combustible material and easy conductive metal objects into the body of the screen in order to avoid a short circuit and fire equipment . 4. Such as the display after the water , cut off the power immediately and contact maintenance personnel , until the screen displays the body panels and dried before use . Off: Turn off the LED display, then turn off the computer. 6. LED display with a damp cloth to wipe the surface not directly , you can use alcohol wipe , or use a brush , vacuum cleaner dust . 7. In the rainy season LED screen one week at least once more. Screen at least once a month generally open , lit more than two hours . 8. Regularly check the security of outdoor LED display supporting structure and the stability of the power supply cable is damaged should be promptly treated . 9. Do not arbitrarily forced to cut it off and turn on the display do not frequent power supply , to prevent the impact of the surge current. Avoid excessive current wire heating power is too large , LED die is damaged, affect the life of the display . Never attempt to disassemble , stitching Screen ! 10. LED screen host computer and other related equipment, should be placed in air-conditioning, dust the room , in order to ensure stable operation of the computer and ventilation . 11. LED outdoor screen inside the lines , you need professional maintenance. 12. Before the beginning of summer, a year ahead of time to cool the heat should be checked within the device display , such as air conditioners , fans , etc., in order to ensure that the display in the permissible ambient temperature operation. 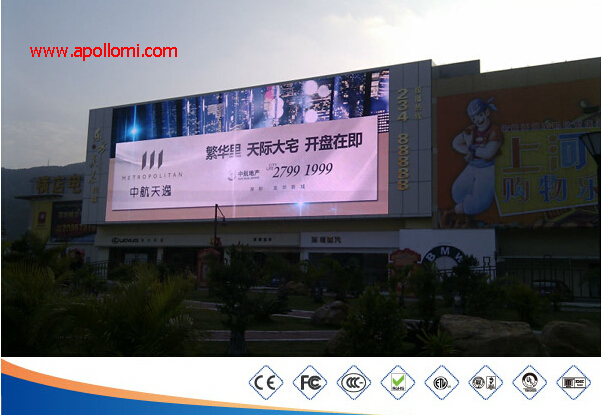 APOLLOMI season to remind you , please do outdoor LED screen of security, maintenance, APOLLOMI staff at your service! 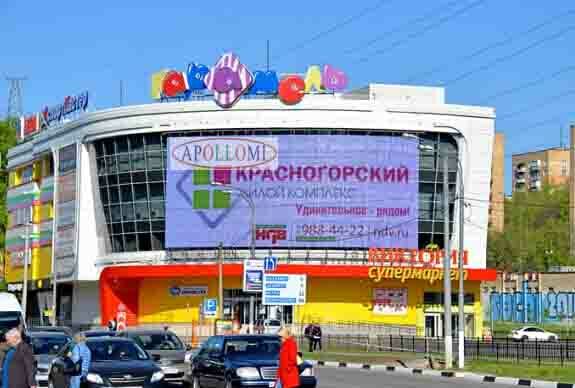 a successful classic project in Russia is done by APOLLOMI; the Athena Mesh display of 202.4sqm has installed successfully outside of a supermarket, this curved full color LED Display measures 9.2m high by 22m wide with a high brightness and proper transparent effect, it is designed for creative outdoor advertising where long viewing distance and wide viewing angle are essential. 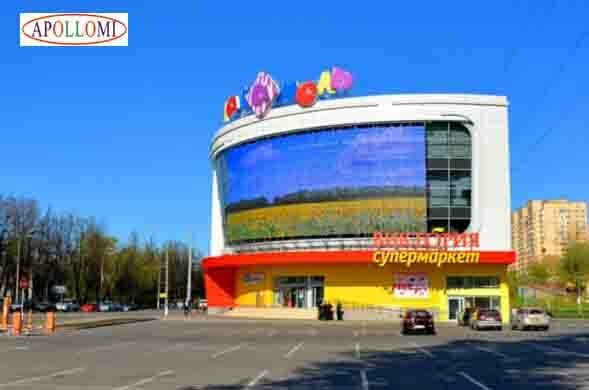 People pass by the supermarket are attracted easily by the huge LED screen installed above the gate outside the building that has brought a great advertising effect. Client is very satisfied with the display and expects the next cooperation with APOLLOMI.